It is very early Thursday morning here on the northern shore of the Sea of Galilee. After figuring out some computer networking problems, I’m up and running again this morning! 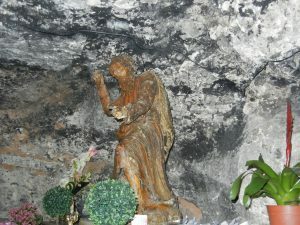 Statue of the Prophet Elijah in cave within the church of Santa Maria Stella Maris. Wednesday morning begin for our pilgrimage on Mt. Carmel. Mt. Carmel extends some 25 miles and overlooks the Jezreel Valley. Our morning began at the cave of the prophet Elijah. You may wish to read 1 Kings, Chapters 18 – 19 for the passages which are specific to the significance of this location. Elijah was by his own declaration a man who was zealous for the Lord. This site reminds us that God does reveal Himself to those who seek and serve Him. Many of our group have indicated one big reason for making a pilgrimage to the Holy Land is to grow in their relationship with the Lord. It is powerful to stand in this place, touching the walls or ceiling of this cave, and praying to be open to God’s desire, and to give voice to the desire deep within one’s heart for the Lord. Also here in this chapel is a large statue of Our Lady of Mt. Carmel. 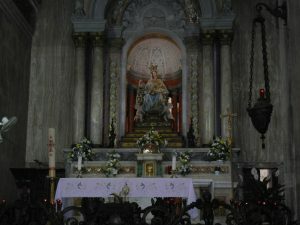 Of course, in the image, Our Lady is holding the brown scapular. The scapular was revealed by Our Lady to St. Simon Stock during a difficult period for the Carmelite Order. There is also a beautiful and fairly new statue of another famous Carmelite, St. Teresa of Avila. This year is the 500th anniversary of her birth. There is also a large image recalling another Arab Carmelite, Blessed Mary of Jesus Crucified. Pope Francis will canonize her a saint next month. Of course a few of the other well known Carmelites recalled in this chapel are St. John of the Cross of St. Therese, the Little Flower. As a little background, the State of Israel has only existed as a state since 1948. Presently there are approximately 8 million people living in Israel, a section of land equivalent in size to the state of New Jersey. The present population is roughly 80% Jewish, 18% Muslim and less than 2% Christian. The population are either Israeli Jews or Israeli Arabs. It is important to realize that a portion of the Arabs are Christian. The number of Christians in Israel and well as throughout the Middle East is in sharp decline. From Mt. Carmel we made our way East to Nazareth. 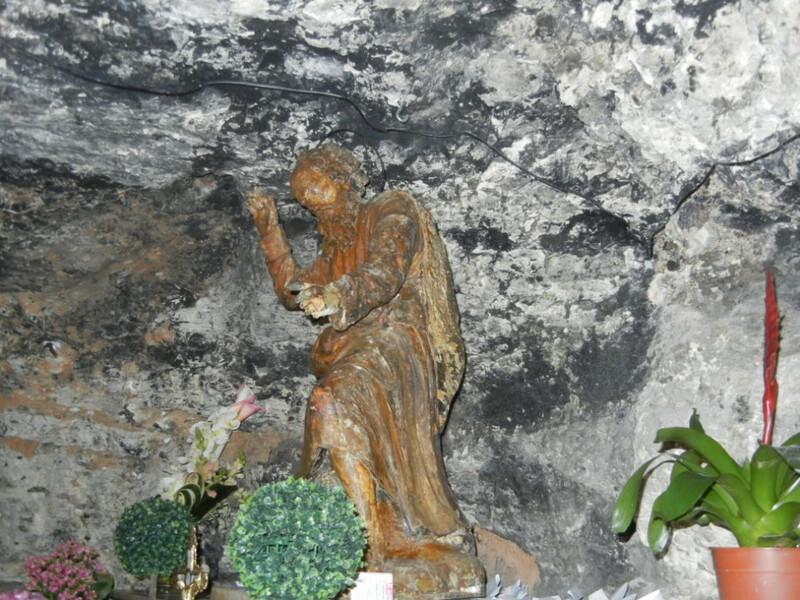 In the time of Jesus, in Nazareth, families lived in grottos or small caves. For the most part, there were no ‘built’ structures or homes. It was a very small community, of no more than 200 – 500 families. 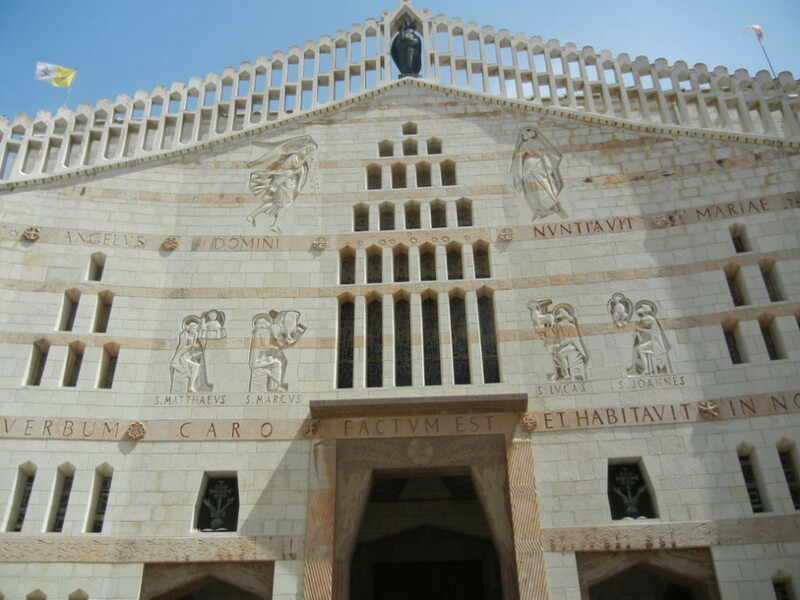 It is here in Nazareth that Mary lived with her parents, Joachim and Anne. 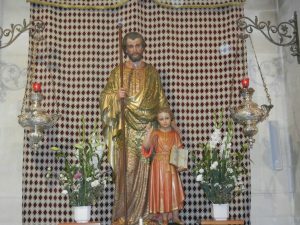 Tradition holds that Joachim was a temple priest, and so he and his family would have made pilgrimage to Jerusalem three times a year for the major feasts of Passover, Pentecost and the Feast of Booths. So the family probably had a home in Jerusalem as well. 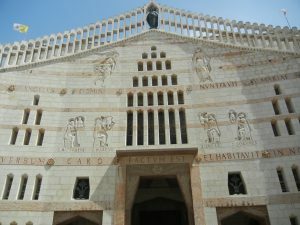 It is in Nazareth where the angel Gabriel appeared to Mary to announce to her that she was to be the Mother of the Savior. (see Luke 1: 26-38) Here in this humble setting, the history of the world changed; “God became flesh and dwelt among us.” (John 1:14) There is perhaps no other place on earth that tells us more clearly that God does desire to be known, loved and served. God does desire to be in intimate relationship with each and every person. 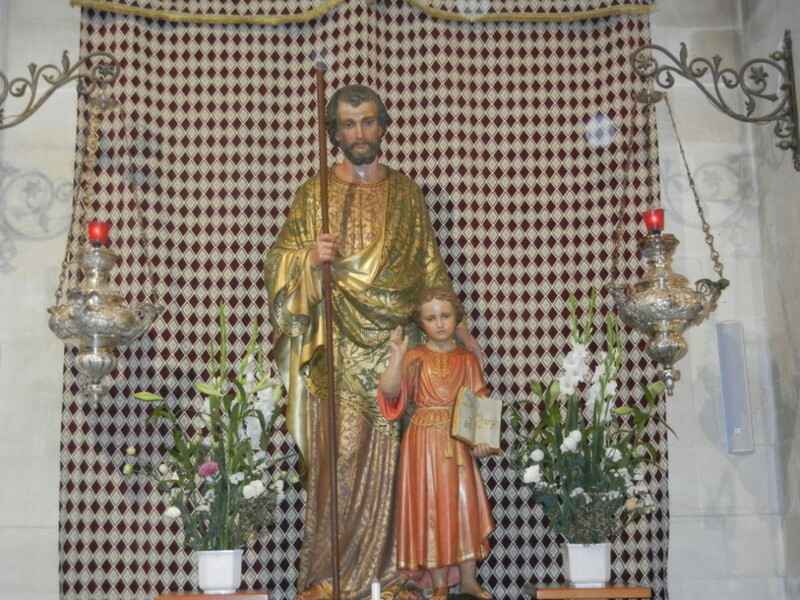 Keeping in mind how small Nazareth was at the time of Jesus, no more than 100 yards up the hill from the home of Mary is the home believed to belong to St Joseph, and of course, eventually became the home of the Holy Family. In this home, Jesus grew under the loving presence of Mary and Joseph. Here would also have been the workshop of St. Joseph. And, as one of the pilgrims remarked as we were leaving this church, he now has serious doubts about Joseph being a carpenter. The location would tend to indicate stronger evidence that he would more than likely St. Joseph would have been a stone mason. From Nazareth we continued our drive through the beautiful Galilean countryside to the Sea of Galilee. The majority of Jesus time was spent in this territory. It is a rich area with many fertile valleys and a few small mountains, including Mt. Tabor, which we will visit today. Jesus would have walked much, and spent many nights with his disciples in the open air, under the stars of the sky. No wonder so much of his preaching so regularly recalls the pastoral settings. We eventually arrived at the Mt. of Beatitudes where our group enjoyed a lovely meal and our first of three nights. 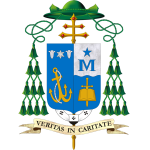 Please know of our prayers for all of you, and please continue to pray for us.